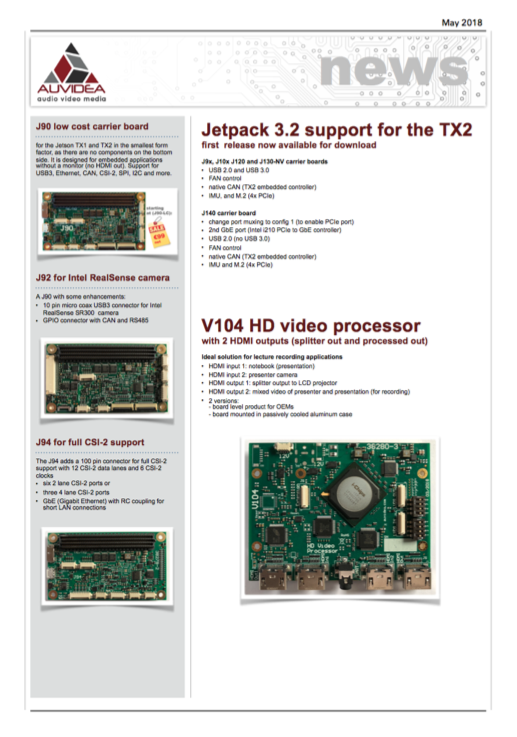 The J100 carrier has the same form factor and size as the TX compute module. It is plugged in below the TX1 and brings out many interfaces on connectors. 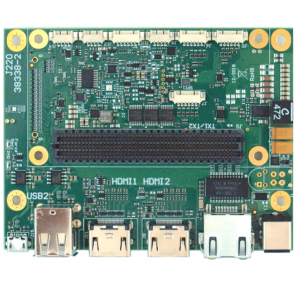 Furthermore in can be plugged in a specifically designed modular motherboard to bring out more interfaces and to integrate it with other components for UAV applications. 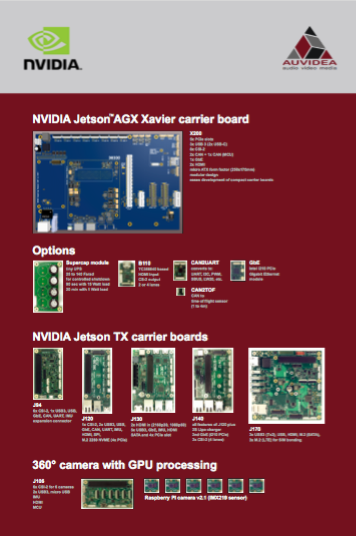 On the picture on the left the J100 is mounted underneath the TX1 compute module. The stacking height is 7mm. The 400 pin SAMTEC connector is shown which connects the J100 to the TX1. On the right are the 2 USB3 connectors and on the bottom side of the J100 is the micro SD card reader. The stickup is very densely packed – there is just a very small air gap in between the USB connectors and the metal shielding underneath the TX module. The 9 pin USB3 connectors may be wired to a standard USB3 type A connector. This is a view from the other side. In the middle is the 4 pin fan connector. On the left is the 6 pin UART (TTL level) connector. 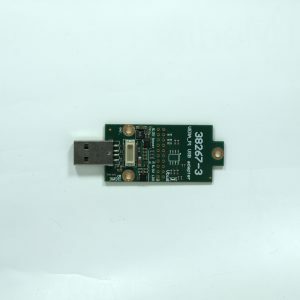 It brings out UART 0 which is the debug port of the TX1. On the right is the 4 pin 12V power input. The J100 may be operated standalone with the TX1 on top. 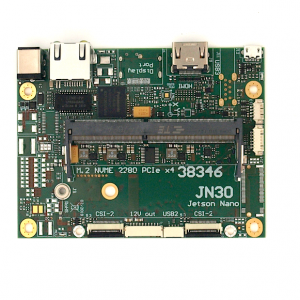 Alternatively the J100 may be plugged into a modular motherboard. In this case the system may be powered form the motherboard. Two redundant power inputs are provided on the 30 and 60 pin connectors on the bottom of the J100. This is a view from the front side. Again it shows the very dense packing. In the middle is the mini HDMI connector for the HDMI output of the TX1. To the left and right are the four CSI-2 connectors for 15 and 22 FFC cables. The connect the B101 and B102 modules for multi-channel HDMI ins. The FFC cables can be inserted easily as the locking mechanism can easily be operated without the need for special tools. Just lift the brown locker up. insert the FFC cable and push the locker back down. 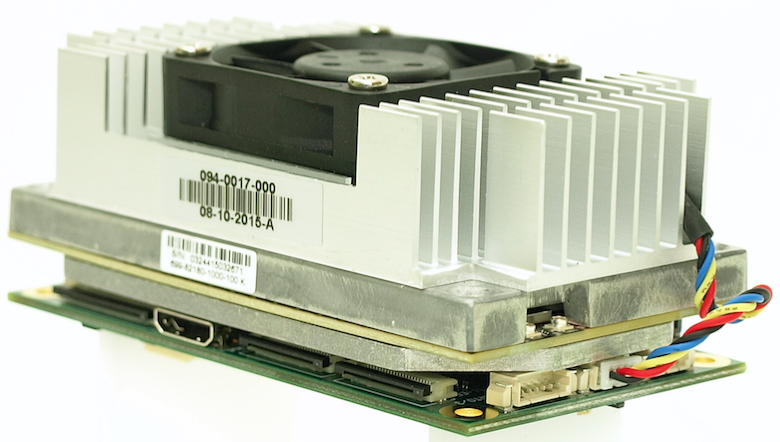 This picture shows the J100 with TX1 without heatsink. 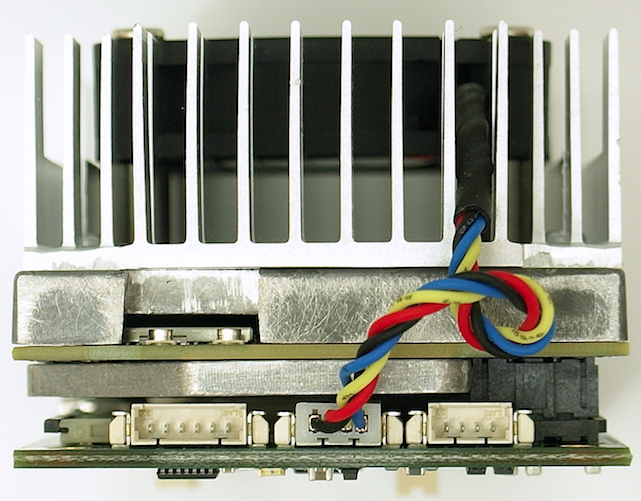 The height is 16mm from the bottom edge of the PCB of the J100 to the top of the TX1 without the heatsink. Please note, that this does not include the height of the components on the bottom side of the J100. The maximum components height on the bottom is 5 mm. This is the height of the 3 connectors. This is a view of the bottom side of the J100. It shows the 30 pin DF17 connector which connects to the modular motherboard. The 30 and 60 pin connectors on top are extension connectors with the SATA and 4 lane PCIe busses. 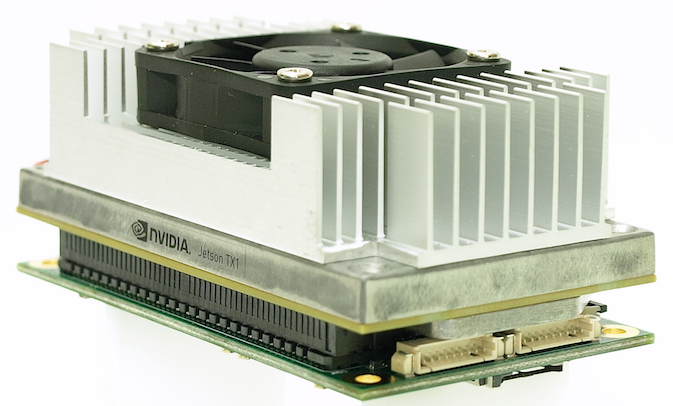 Here the J100 is mounted on a specifically designed motherboard. 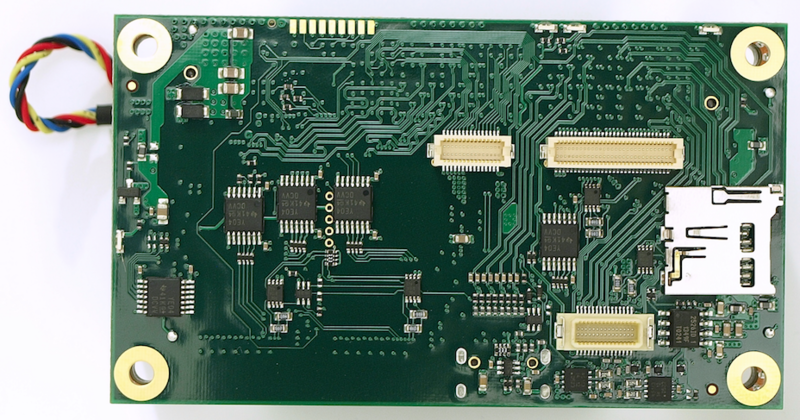 The picture shows the actual PCB but it not populated yet. Just the 400 pin connector for the TX1 is placed. 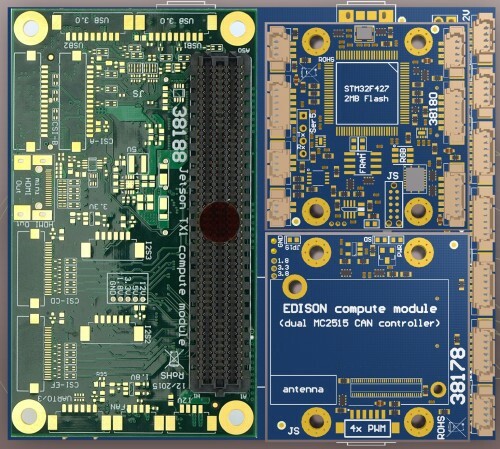 On the right are two slots for additional modules like a flight controller and an Intel Edison compute module. 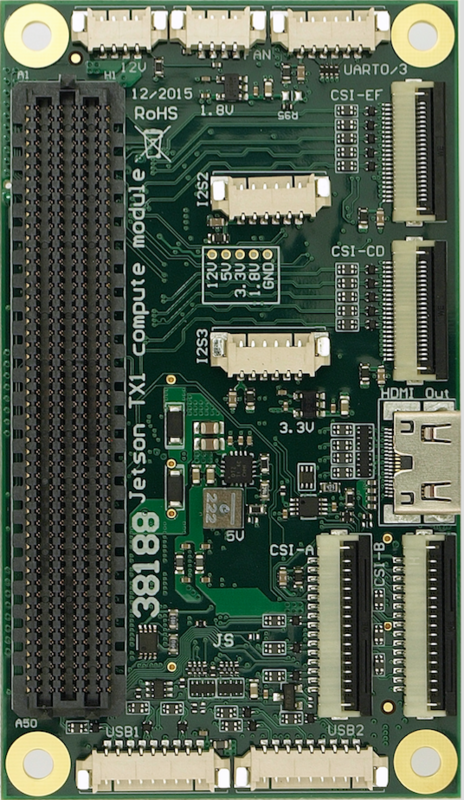 All modules are powered by the motherboard and interconnected with one or two CAN busses. Preorders are taken now. The price is €199.00 net plus shipping (and plus VAT, if applicable). Please send an email to enquire and order.